I'm always on the lookout for new and interesting nail trends so when I heard about the Barry M Sunset Daylight Curing Nail Paints, I had to give them a go. Armed with the special top coat, my first choice was the shade You Drive Me Navy. If you're new to the concept, these type of nail paints are different to the usual offering from Barry M. With your traditional gel nail polish, you need to set the colour with a UV lamp. However, with Barry M's version, the same kind of effect can be achieved simply using daylight. I'll admit, I was sceptical when I first heard about the concept. With the need for a special topcoat and specially selected shades I felt that it might be a ploy to encourage you to buy more expensive polishes but after trying out the shade, it's definitely not the case. 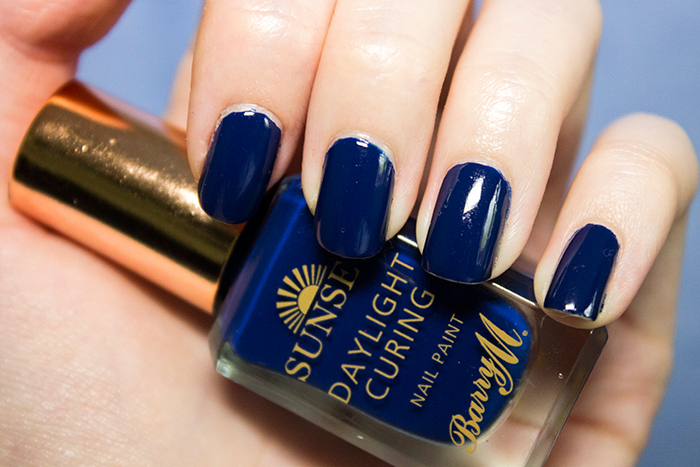 You first apply the Sunset polish of your choice, in my case it was the shade You Drive Me Navy. A gorgeous glossy navy blue which looks gorgeous on everyone. I noticed right away that the formula was much thicker than your typical Barry M polish and applied much like a gel so it's important to be precise where you apply it. Once two coats of the colour are applied, you also need the Sunset Daylight Curing Topcoat which sets the colour in place. This is essential to the process to make sure your polish is properly set like you would with a gel. It's not too long after that you're left with that glossy, smooth finish which makes it near impossible to tell the difference against a real gel finish. As for longevity, the polish lasted very well. Infact, so well that the only reason I had to remove it was that my nails had grown, leaving a space! Overall I was really impressed by the polish and I'll definitely have to try out more shades. I think it's a great alternative to gel polishes, saving a few pennies and not having the damage that gel nail polish brings.